Up until about a year and a half ago, I was the moderately successful, local, sagaftra, actor Vic Clay. 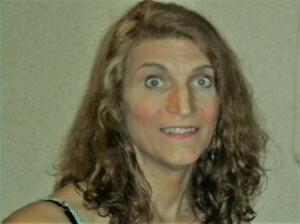 At that time, I began my transition to female. Now, my union card says Tori Clay. The only negative in my transition to this point has been lack of gigs and even auditions. Currently, I perform sporadically in the “Surreal Soiree” which is a multi-media, rock and rap, opera with animation, dance, film, and original live rock music played by a kickass band. I am the acting coach, co-director, and I sing and dance in the chorus with the other women. We have performed it about 6 times so far. It could be more but we have a lot of logistical things to deal with, resulting in lack of rehearsals. One could say our performances are our rehearsals so far. Last one was last week by invitation of the IFFB in Boston. Next up is this week in Nantasket. My only other 2 gigs are a couple months ago finally making it into a studio film as a woman. A one day, bg, gig but they put me with the star all day so I have a shot at not being cut. By far my best gig was last summer on stage for a month at the BCA, acting with a small ensemble cast in a show that the Boston Globe rated as in The Top Ten Best of Boston Theatre for 2016, “T-Party”. I had the crowd in the palm of my hand doing it. I even experienced hthem break the wall and shout “we love you Tori” at a point in my long monologue wherein I broke down a bit, to cheer me up! I am making every effort to leave the old, long and varied, resume of my prior life behind and not trade on it but it contains credits doing anything an actor or actress can do for the small or large screen, stage, audience, or radio. They included acting, directing, producing, writing, coaching, stunts, standup, musician, comedy improv, camera, precision and stunt driving and more in about 70 films and 24 plays. I think that shows why I have to make people forget about that and start all over, even doing unpaid work again, with no less commitment than I devoted to paid work. I will be perfectly candid here and say that I am now a senior citizen, I am hearing impaired, I have a voice incongruent to my female appearance, and I will never be regarded as “beautiful”. To round out your knowledge of me, I will say that I enjoy playing tennis, playing guitar, and riding my motorscooters plus most cultural events and activities.